Introduction to ASP.NET Core and Asp.Net Core 2.X? 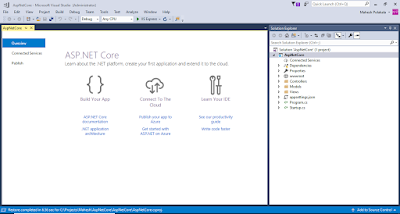 Asp.Net Core is a cross platform open source framework for building modern, cloud based, Internet connected applications. With ASP.net Core you can. You can build Web App’s, Web API’s, Services, IOT apps ect..
You can deploy Cloud or on premise as well. Why to use Asp.net Core? ASP.NET Core is Redesigned for ASP.NET 4.X, with architectural changes that results in a leaner, more modular framework. Razor Pages makes coding page focused scenarios easier and more productive. Ability to develop and run on Windows, macOS and Linux. A lightweight, high performance and modular HTTP request pipeline. Ability to host on IIL, Ngix, Apache, Docker or Self host. ASP.Net Core > =1.0 will support VS-2015 ,Asp.net core 2.0 will support VS-2017. If you want to download Asp.Net core, Download here. https://dotnet.microsoft.com/download. You can see Windows, linux and mocOS in the given Link. Note: Now the latest Asp.Net core version is Asp.Net Core 3.0. Choosing Between Asp.Net Core and Asp.Net Framework for server applications? Asp.Net Core and Asp.Net both shares same components. However, while choosing the framework there is a fundamental difference between both. You Application need Cross Platform. Your application need high performance and scalable. Your application will target Micro Services. Your application need to host in IIS, NGix, Apache and Docker container. Your application is currently working on .Net framework. .Net framework with different platform. 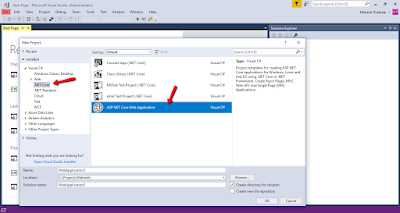 How to Create Asp.net Core Web Application? Open Visual Studio 2017 => File New Project=> and left side Select .NET Core and Select Asp.NET Core Web Application. If suppose, click on Web in the given window. You will get both ASP.NET Framework and ASP.NET core application. At the Top of window you need to select Which .Net Core version you are selecting. We have Asp.NET Core 2.0, Asp.NET Core 2.1, Asp.NET Core 2.2. So the latest version is Asp.NET Core 2.2. So select latest version Asp.NET Core 2.2. Here, I have created the Web Application with Model, View and controller. After Successful creation, We can get below view. What is wwwroot In Asp.Net Core? In the wwwroot folder, there should be separate folders for different type of files. Note: For accessing the Static flies we should include middleware method in the Startup.cs class file. In ASP.NET Core 2.X by default it will provide middleware method. the UseStaticFiles() will be included in the Startup.cs class in the configuration. What is Program.cs In Asp.Net Core? WebHostBuilder is used to create and configure a host to the web application. .Usekestral() Kestral is a open source cross platform internal web server for Asp.Net Core. It is used to be proxy. but also Apache, Ngix etc..
.UseIISIntegration(): this method specifies IIS is the internal webserver. .UseStartup<Startup>() this method specifies startup class to be used by the webserver. 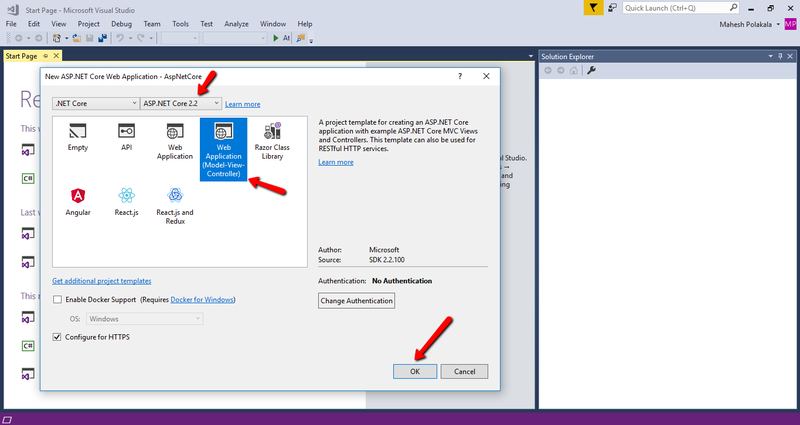 By default Startup.cs file will create in the Asp.Net Core application. Startup class is same as Global.asax file in the Asp.Net Framework. We can create and configure request pipeline in the startup class. We can rename Startup.cs class with any other name it not mandatory. .Build() It will build the IWebHost and return which host by the web application internally. After building the web host application, host.Run() method will start and run the web application and block calling thread until host shutdown. 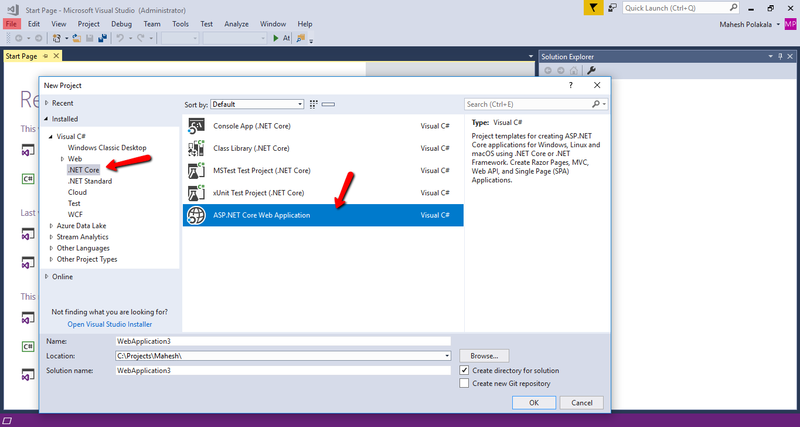 Asp.Net Core application start with main method of program class and executes one by one. What is Startup class In Asp.Net Core? Startup class contained in the Startup.cs file in the root folder of the project. Startup class is same like Global.asax file in the .Net framework. Startup class executes first, when application starts. Startup class will be configured using UseStartup<T>() method at the time of configuring the web host in the main method of Program class. Here, In UseStartup<T>() T specifies that class name startup in startup.cs. We can rename this startup.cs with other name also. Some for the configurations in Startup.cs file is shown below. This above method is gets called be the runtime. Use this method to add services to the container. This above method is gets called by the runtime. Use this method to configure the http request pipe line. In this configuration we can use MVC mapping routing, rendering static files, http redirection. Here we can set developing mode and production mode for debugging between development and production deployment. How to Create Model, View and Controller in Asp.Net Core project? In the View Expand View, right click on Home Folder => Add=> View=> add name to the view. From the project right click on the Model folder, Add UserModel.cs class file to the project. Add model properties to the UserModel class. Shown code below. Data Access Layer to the project? For accessing the DB data to the application, I have created DataAccess layer. For data in data access layer, I have crated Interface like IUserDataAccess.cs , for implementing UserDataAccess.cs class files in the DataAccess Folder. Shown in the code below. In the IUserDataAccess interface class, I have declared RegisterUser Method. In the UserDataAccess class, I have extended IUserDataAccess interface. In the derived class, I have implemented RegisterUser method for saving user data into the database from user input. The Added scope in the ConfigurationService in the Startup class is shown below. 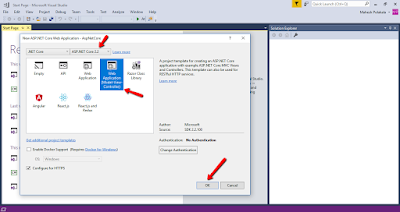 Accessing Dependency Injection in the Controller? Accessing dependency injection classes in the controller is like, By creating constructor to the controller. Is shown below. For passing information from view to controller to Model, in the controller, I have created Register POST method in the Home controller. Shown in the code below. Right Click on the View, Create a view and name it as Register.cshtml. In the View, I have included UserModle at the top @model AspDotNetCore.Models.UserModel. Here, if we overserve the view code. I have added form with Test boxes of input type and added the Model property to asp-for. asp-for="Email" : This will access the email to the Email property in the UserModel class. Run the core application this form will appear shown in below.